SPECIAL DISCOUNT for a limited period! Bali Exception offers you a peaceful and relaxing base away from hectic touristy areas at Villa Kaloi, located only 7 minutes to Goa Gajah Temple and 18 minutes to Ubud Center (Monkey Forest). Villa Kaloi is cosy and calm tropical nest from where you can easily explore nearby Ubud and other destinations in Bali. This newly-constructed villa combines natural wooden traditional Balinese theme with comfortable accommodation and a private infinity pool. The villa has sliding glass doors that open to take full advantage of the cool breeze and the huge deck provides a perfect place for meditation, yoga and relaxation while listening to the sounds from the river, the jungle and songs from the distant temples. The infinity swimming pool faces directly the jungle and the river below. Guests have access to the entire space. The villa is equipped with a friendly, knowledgeable, and professional staff to take care of all of your needs and questions during your stay. A housekeeper will come to the villa each morning to make breakfast, clean and take away and return laundry. The villa manager Ms. Made Ari is on call to help with arranging transportation, meals, tours, yoga instructors or massages. Breakfast is included. 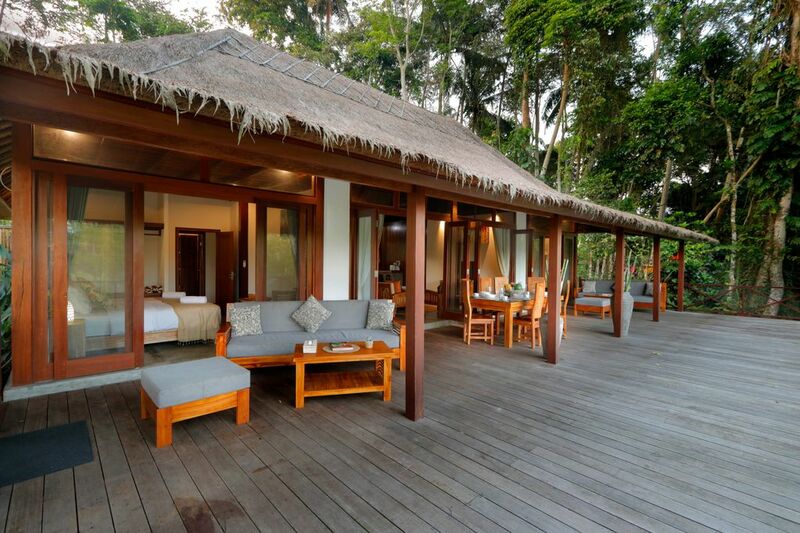 Located in a traditional Balinese community, this villa has a different ambiance to the touristy locations in Bali. You can connect with nature in this peaceful paradise and relax without worrying about traffic congestion and pollution. The location itself is close to the famous Pejeng Moon and Goa Gajah Temples. There are lovely walks by the river or through the nearby rice paddies. Kaloi Villa is only 4 km to Ubud, well known as the artistic and cultural heart of the Island of Gods. From ancient temples to majestic age-old royal palaces, from the monkey forest to wonderful panoramas of green hillsides and rice terraces: you will enjoy a genuine Balinese experience. Spiritual atmosphere, famous yoga shalas, delicious healthy restaurants, art galleries, crafts markets, museums, traditional dance performances and a large range of activities are all here for you to enjoy. - Smoking is allowed only outside of the building, on the deck, by the pool or in the garden. - Party and loud music are not allowed at the villa. - TV cable is not available at the villa, however you can watch movies using the DVD player or USB drives. You can request airport transfer, we will be happy to help you and will provide you a competitive rate: 30 USD. - Driver: a 6/7 passenger car can be used up to 8 hours a day with driver, taking you all the places you would like to visit (prices: starting 350 000 IDR up to 800 000 per car). The house was so welcoming and everything we had hoped for in this amazing setting. Ari treated us so well and really introduced us to the culture. Couldn’t have asked for a better experience. Awesome Villa with jungle views ! Loved those jungle views and infinity pool.